Not to be confused with Henan Province. For other places with the same name, see Hunan (disambiguation). Hunan ( 湖南) is a province of the People's Republic of China, located in the middle reaches of the Yangtze watershed in South Central China; it borders the province-level divisions of Hubei to the north, Jiangxi to the east, Guangdong and Guangxi to the south, Guizhou to the west, and Chongqing to the northwest. With a population of just over 67 million as of 2014[update] residing in an area of approximately 210,000 km2 (81,000 sq mi), it is China's 7th most populous and the 10th most extensive province-level by area. Xiang, Gan, Southwestern Mandarin, Xiangnan Tuhua, Waxiang, Hakka. "South of the (Dongting) Lake"
The name Hunan literally means "south of the lake"; Hu means "lake" while nan means "south.". The lake that is referred to is Dongting Lake, a lake in the northeast of the province; Vehicle license plates from Hunan are marked Xiāng (Chinese: 湘), after the Xiang River, which runs from south to north through Hunan and forms part of the largest drainage system for the province. Its capital and largest city is Changsha, which also abuts the Xiang River. Hunan's primeval forests were first occupied by the ancestors of the modern Miao, Tujia, Dong and Yao peoples. The province entered written Chinese history around 350 BC, when under the kings of the Zhou dynasty, the province became part of the State of Chu. After Qin conquered the Chu heartland in 278 BC, the region came under the control of Qin, and then the Han dynasty. At this time, and for hundreds of years thereafter, the province was a magnet for settlement of Han Chinese from the north, who displaced and assimilated the original indigenous inhabitants, cleared forests and began farming rice in the valleys and plains. The agricultural colonization of the lowlands was carried out in part by the Han state, which managed river dikes to protect farmland from floods. To this day many of the small villages in Hunan are named after the Han families who settled there. Migration from the north was especially prevalent during the Eastern Jin dynasty and the Northern and Southern dynasties periods, when nomadic invaders pushed these peoples south. During the Five Dynasties and Ten Kingdoms period, Hunan was home to its own independent regime, Ma Chu. Hunan and Hubei became a part of the province of Huguang until the Qing dynasty. Hunan province was created in 1664 from Huguang, renamed to its current name in 1723. Hunan became an important communications center due to its position on the Yangzi River. It was an important centre of scholarly activity and Confucian thought, particularly in the Yuelu Academy in Changsha. It was also on the Imperial Highway constructed between northern and southern China. The land produced grain so abundantly that it fed many parts of China with its surpluses. The population continued to climb until, by the nineteenth century, Hunan became overcrowded and prone to peasant uprisings. Some of the uprisings, such as the ten-year Miao Rebellion of 1795–1806, were caused by ethnic tensions. 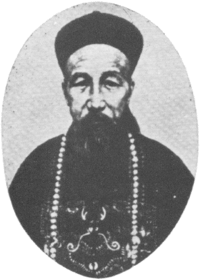 The Taiping Rebellion began in the south in Guangxi Province in 1850. The rebellion spread into Hunan and then further eastward along the Yangzi River valley. Ultimately, it was a Hunanese army under Zeng Guofan who marched into Nanjing to put down the uprising in 1864. Hunan was relatively quiet until 1910 when there were uprisings against the crumbling Qing dynasty, which were followed by the Communist's Autumn Harvest Uprising of 1927. It was led by Hunanese native Mao Zedong, and established a short-lived Hunan Soviet in 1927. The Communists maintained a guerrilla army in the mountains along the Hunan-Jiangxi border until 1934. Under pressure from the Nationalist Kuomintang (KMT) forces, they began the Long March to bases in Shaanxi Province. After the departure of the Communists, the KMT army fought against the Japanese in the second Sino-Japanese war. They defended Changsha until it fell in 1944. Japan launched Operation Ichigo, a plan to control the railroad from Wuchang to Guangzhou (Yuehan Railway). Hunan was relatively unscathed by the civil war that followed the defeat of the Japanese in 1945. In 1949, the Communists returned once more as the Nationalists retreated southward. As Mao Zedong's home province, Hunan supported the Cultural Revolution of 1966–1976. However, it was slower than most provinces in adopting the reforms implemented by Deng Xiaoping in the years that followed Mao's death in 1976. In addition to Mao Zedong, a number of other first-generation communist leaders were also from Hunan: President Liu Shaoqi; General Secretaries Ren Bishi and Hu Yaobang; Marshals Peng Dehuai, He Long, and Luo Ronghuan; Wang Zhen, one of the Eight Elders; Xiang Jingyu, the first female member of the party's central committee; Senior General Huang Kecheng; and veteran diplomat Lin Boqu. An example of a more recent leader from Hunan is former Premier Zhu Rongji. Hunan is located on the south bank of the Yangtze River, about half way along its length, situated between 108° 47'–114° 16' east longitude and 24° 37'–30° 08' north latitude. Hunan covers an area of 211,800 square kilometres (81,800 square miles), making it the 10th largest provincial-level division. The east, south and west sides of the province are surrounded by mountains and hills, such as the Wuling Mountains to the northwest, the Xuefeng Mountains to the west, the Nanling Mountains to the south, and the Luoxiao Mountains to the east. Mountains and hills occupy more than 80% of the province, and plains less than 20%. At 2115.2 meters above sea level, the highest point in Hunan province is Lingfeng (酃峰). The Xiang, the Zi, the Yuan and the Lishui Rivers converge on the Yangtze River at Lake Dongting in the north of Hunan. The center and northern parts are somewhat low and a U-shaped basin, open in the north and with Lake Dongting as its center. Most of Hunan lies in the basins of four major tributaries of the Yangtze River. Lake Dongting is the largest lake in the province and the second largest freshwater lake of China. The Xiaoxiang area and Lake Dongting figure prominently in Chinese poetry and paintings, particularly during the Song dynasty when they were associated with officials who had been unjustly dismissed. Changsha (which means "long sands") was an active ceramics district during the Tang dynasty, its tea bowls, ewers and other products mass-produced and shipped to China's coastal cities for export abroad. An Arab dhow dated to the 830s and today known as the Belitung Shipwreck was discovered off the small island of Belitung, Indonesia with more than 60,000 pieces in its cargo. The salvaged cargo is today housed in nearby Singapore. The Furongian Epoch in the Cambrian Period of geological time is named for Hunan; Furong (芙蓉) means "lotus" in Mandarin and refers to Hunan which is known as the "lotus state". The fourteen prefecture-level divisions of Hunan are subdivided into 122 county-level divisions (35 districts, 17 county-level cities, 63 counties, 7 autonomous counties). Those are in turn divided into 2587 township-level divisions (1098 towns, 1158 townships, 98 ethnic townships, 225 subdistricts, and eight district public offices). At the year end of 2017, the total population is 68.6 million. ^ a b New district established after census: Wangcheng (Wangcheng County). The new district not included in the urban area & district area count of the pre-expanded city. ^ a b New district established after census: Lukou (Zhuzhou County). The new district not included in the urban area & district area count of the pre-expanded city. ^ Ningxiang County is currently known as Ningxiang CLC after census. The politics of Hunan is structured in a dual party-government system like all other governing institutions in mainland China. The Governor of Hunan is the highest-ranking official in the People's Government of Hunan. However, in the province's dual party-government governing system, the Governor has less power than the Hunan Communist Party of China Provincial Committee Secretary, colloquially termed the "Hunan CPC Party Chief". As of the mid 19th century, Hunan exported rhubarb, musk, honey, tobacco, hemp, and birds. The Lake Dongting area is an important center of ramie production, and Hunan is also an important center of tea cultivation. Aside from agricultural products, in recent years Hunan has grown to become an important center for steel, machinery and electronics production, especially as China's manufacturing sector moves away from coastal provinces such as Guangdong and Zhejiang. The Lengshuijiang area is noted for its stibnite mines, and is one of the major centers of antimony extraction in China. As of 2016, its nominal GDP was USD 475 billion (CNY 3.16 trillion), the per capita GDP was USD 6,983 (CNY 46,382). The Changsha National Economic and Technology Development Zone was founded in 1992. It is located east of Changsha. The total planned area is 38.6 km2 (14.9 sq mi) and the current area is 14 km2 (5.4 sq mi). Near the zone is National Highways G319 and G107 as well as Jingzhu Highway. Besides that, it is very close to the downtown and the railway station. The distance between the zone and the airport is 8 km (5.0 mi). The major industries in the zone include high-tech industry, biology project technology and new material industry. Approved by the State Council, Chenzhou Export processing Zone (CEPZ) was established in 2005 and is the only export processing zone in Hunan province. The scheduled production area of CEPZ covers 3km2. The industrial positioning of CEPZ is to concentrate on developing export-oriented hi-tech industries, including electronic information, precision machinery, and new-type materials. The zone has good infrastructure, and the enterprises inside could enjoy the preferential policies of tax-exemption, tax-guarantee and tax-refunding. By the end of the “Eleventh Five-Year Plan”, the CEPZ achieved a total export and import volume of over US$1 billion and provided more than 50,000 jobs. It aimed to be one of the first-class export processing zones in China. Zhuzhou Hi-Tech Industrial Development Zone was founded in 1992. Its total planned area is 35 km2 (14 sq mi). It is very close to National Highway G320. The major industries in the zone include biotechnology, food processing and heavy industry. In 2007, the park signed a cooperation contract with Beijing Automobile Industry, one of the largest auto makers in China, which will set up a manufacturing base in Zhuzhou HTP. As of the 2000 census, the population of Hunan is 64,400,700 consisting of forty-one ethnic groups. Its population grew 6.17% (3,742,700) from its 1990 levels. According to the census, 89.79% (57,540,000) identified themselves as Han people, 10.21% (6,575,300) as minority groups. The minority groups are Tujia, Miao, Dong, Yao, Bai, Hui, Zhuang, Uyghurs and so on. 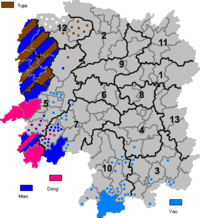 In Hunan, ethnic minority languages are spoken in the following prefectures. Around 5,000 Uyghurs live around Taoyuan County and other parts of Changde. Hui and Uyghurs have intermarried in this area. In addition to eating pork, the Uygurs of Changde practice other Han Chinese customs, like ancestor worship at graves. Some Uyghurs from Xinjiang visit the Hunan Uyghurs out of curiosity or interest. Also, the Uyghurs of Hunan do not speak the Uyghur language, instead, they speak Chinese as their native language. The predominant religions in Hunan are Chinese Buddhism, Taoist traditions and Chinese folk religions. According to surveys conducted in 2007 and 2009, 20.19% of the population believes and is involved in ancestor veneration, while 0.77% of the population identifies as Christian. The reports didn't give figures for other types of religion; 79.04% of the population may be either irreligious or involved in worship of nature deities, Buddhism, Confucianism, Taoism, folk religious sects. Puguang Buddhist Temple in Zhangjiajie. Temple of Confucius in Liuyang. An ancestral shrine in the province. Xiang Chinese (湘語) is the biggest native language to Hunan province, and it is also a group of Chinese dialects spoken in most parts of Hunan and in a few adjacent areas. In addition to Xiang Chinese, there are also some other Chinese varieties and some non-Chinese native languages, spoken in many places of Hunan province. Hunanese cuisine is noted for its use of chili peppers. Huaguxi is a local form of Chinese opera that is very popular in Hunan province. Nü shu is a writing system that was used exclusively among women in Jiangyong County and a few neighbor countryside places, in south Hunan. Local women read Nü shu with their native language - Xiangnan Tuhua, a very special local Chinese variety, which is not intelligible with any other Chinese. Hunan's culture industry generated 87 billion yuan (US$11.76 billion) in economic value in 2007, a major contributor to the province's economic growth. The industry accounts for 7.5 percent of the region's GDP - 0.9 percentage points higher than the previous year. Wulingyuan features thousands of quartzite sandstone peaks. Located in the south central part of the Chinese mainland, Hunan has long been known for its natural environment. It is surrounded by mountains on the east, west, and south, and by the Yangtze River on the north. For thousands of years, the region has been a major center of agriculture, growing rice, tea, and oranges. China's first all glass suspension bridge was also opened in Hunan, in Shiniuzhai National Geological Park. ^ "National Data: Annual by Province". National Bureau of Statistics of China. 29 April 2011. Retrieved 4 August 2013. ^ 湖南省2017年国民经济和社会发展统计公报 [Statistical Communiqué of Hunan on the 2017 National Economic and Social Development] (in Chinese). Hunan Bureau of Statistics. 2018-03-12. Retrieved 2018-06-22. ^ Harold Wiens. Han Expansion in South China. (Shoe String Press, 1967). ^ Alfreda Murck (2000). Poetry and Painting in Song China: The Subtle Art of Dissent. Harvard Univ Asia Center. ISBN 978-0-674-00782-6. ^ Peng, Shanchi; Babcock, Loren; Robison, Richard; Lin, Huanling; Rees, Margaret; Saltzman, Matthew (30 November 2004). "Global Standard Stratotype-section and Point (GSSP) of the Furongian Series and Paibian Stage (Cambrian)" (PDF). Lethaia. 37 (4): 365–379. doi:10.1080/00241160410002081. Retrieved 14 September 2012. ^ Government, Hunan. "Hunan Government Website International-enghunan.gov.cn". www.enghunan.gov.cn. ^ 1912年中国人口. Ier.hit-u.ac.jp. Retrieved 6 March 2014. ^ 1928年中国人口. Ier.hit-u.ac.jp. Retrieved 6 March 2014. ^ 1936-37年中国人口. Ier.hit-u.ac.jp. Retrieved 6 March 2014. ^ 1947年全国人口. Ier.hit-u.ac.jp. Retrieved 6 March 2014. ^ stin Jon Rudelson, Justin Ben-Adam Rudelson (1992). Bones in the sand: the struggle to create Uighur nationalist ideologies in Xinjiang, China. Harvard University. p. 30. Retrieved 2010-06-28. ^ Ingvar Svanberg (1988). The Altaic-speakers of China: numbers and distribution. Centre for Mult[i]ethnic Research, Uppsala University, Faculty of Arts. p. 7. ISBN 91-86624-20-2. Retrieved 2010-06-28. ^ Kathryn M. Coughlin (2006). Muslim cultures today: a reference guide. Greenwood Publishing Group. p. 220. ISBN 0-313-32386-0. Retrieved 2010-06-28. ^ Chih-yu Shih, Zhiyu Shi (2002). Negotiating ethnicity in China: citizenship as a response to the state. Psychology Press. p. 133. ISBN 0-415-28372-8. Retrieved 2010-06-28. ^ Chih-yu Shih, Zhiyu Shi (2002). Negotiating ethnicity in China: citizenship as a response to the state. Psychology Press. p. 137. ISBN 0-415-28372-8. Retrieved 2010-06-28. ^ Chih-yu Shih, Zhiyu Shi (2002). Negotiating ethnicity in China: citizenship as a response to the state. Psychology Press. p. 138. ISBN 0-415-28372-8. Retrieved 2010-06-28. ^ Chih-yu Shih, Zhiyu Shi (2002). Negotiating ethnicity in China: citizenship as a response to the state. Psychology Press. p. 136. ISBN 0-415-28372-8. Retrieved 2010-06-28. ^ "China's first glass-bottom bridge opens - CNN.com". CNN. Retrieved 2015-09-29. Wikimedia Commons has media related to Hunan. Chisholm, Hugh, ed. (1911). "Hu-nan" . Encyclopædia Britannica (11th ed.). Cambridge University Press.